On March 15, 2012 the new ADA standards regarding the accessibility of public playgrounds in the United States went into effect. These new ADA standards addressed routes, surfacing, ramps, access and transfer spaces, ground level activities and more. The US Department of Justice is serious about ensuring that public playgrounds are accessible for all children. Childforms want to help you ensure your playground is compliant. Contact us to discuss a plan to bring your playground into compliance with the new ADA playground standards. Visit ada.gov to read the full text of the ADA guidelines on accessibility. The purpose of this ADA site is to raise awareness and provide education about some considerations to promote ADA compliance. It should not be considered all-encompassing. We encourage you to read the Standards and seek additional information if necessary. Please refer to manufacturer specifications and safety warnings and continue to provide normal safety inspections. Safety goes beyond these comments, requires common sense, and is specific to the playground involved. Within the play area, the safety surfacing must comply with ASTM F 1292-99 or -04 Standard Specification for Impact Attenuation of Surface Systems Under and Around Playground Equipment when located within the use zone for proper impact attenuation. All accessible routes within the play area, clear floor or ground spaces at play components required to be accessible and turning spaces must comply with ASTM 1951-99 Standard Specification for Determination of Accessibility of Surface Systems Under and Around Playground Equipment. Transfer steps are maximum of 8” high and include handholds to aid movement. Minimum 30” by 48” transfer space must be provided adjacent to the transfer platform. The 48” long minimum dimension of the transfer space shall be centered on and parallel to the 24” long minimum side of the transfer platform. The side of the transfer platform serving the transfer space shall be unobstructed. Elevated ramps must be at least 36” wide, maximum running slope of 1:12 and maximum length of 144”(12 feet) before providing a landing. 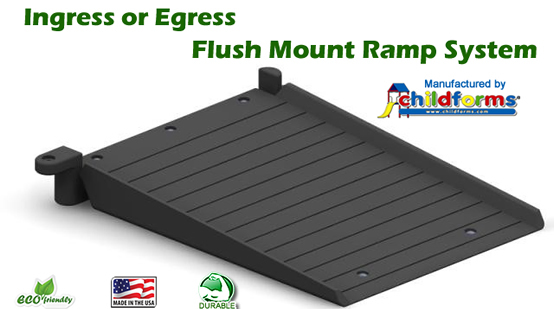 Elevated ramps must include handrails on both sides meeting hand-gripping criteria and with a height between 20-28”. Elevated ramps with handrails, barriers beyond the ramp edge and barriers not extending within 1” of the ramp surface must have edge curbing at least 2” high for the entire ramp length. No handrail extensions are required. When elevated ramps change in direction, a 60”x 60”minimum level landing must be provided at both the top and the bottom of each run. Elevated ramps and accessible platforms attached at ramp levels shall have no openings on surface greater than 1/2” and vertical change in level less than 1/4” or up to 1/2” with a 2:1 beveled edge. Wheelchair – accessible platforms require guardrails or barriers. Openings for access/egress play components shall be narrowed to 15” or less. Advisory Reach ranges for accessible manipulative and interactive sensory and communicative components must have reach range heights between 16-44” for 9-12 year old, 18-40” for 5-8 year old and 20-36” for 3-4 year old user age groups. Ground level upper body equipment intended for use by a person using a mobility device must be less than 54” above protective surfacing. Ground level play tables and components for users over 5 years old must have a minimum vertical knee clearance of at least 24” high, a minimum depth of at least 17” deep and a minimum width of at least 30”. The maximum top of playing surface shall not exceed 31”. Composite play structures must have elevated accessible routes by ramp and or transfer systems to connect at least 50% of the elevated play components. Large composite play structures with more than 20 elevated play components must have at least 25% of the elevated play components connected by elevated ramps. Play areas must have the minimum number of accessible play components and types on the accessible routes per the following criteria: Remember it is one of each type at ground level and 50% elevated that must be accessible. The trigger to use the table is for Additional Number and Types. Where elevated play components are provided, ground level play components shall be provided in accordance with Table 240.2.1.2 and shall comply with 1008.4. 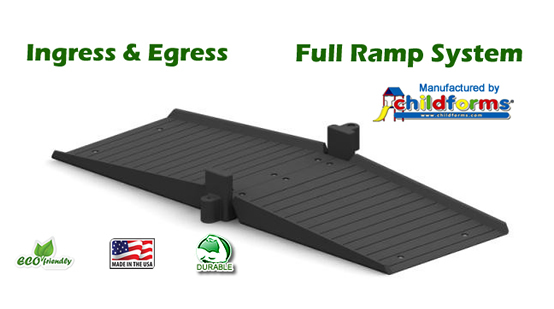 EXCEPTION: If at least 50 percent of the elevated play components are connected by a ramp and at least 3 of the elevated play components connected by the ramp are different types of play components, the play area shall not be required to comply with 240.2.1.2.